I wanted to mention a topic of conversation I hear frequently with regards the benefits of base layers such a Patagonia Capilene (synthetic) versus merino wool products. Worth mentioning is that there are a ton of other options on the market to include high-tech moisture wicking materials, anti-odor materials, materials under development by NASA and the U.S. military to allow the person wearing them to control their thermoregulation and stink for prolonged periods, etc. My point with this blog was merely to identify a quick list of pro’s and con’s regarding Capilene and merino wool so the user can make an educated decision. Many people are polarized on their opinion regarding this topic, but many don't seem to understand the rationale of choosing one over another. My opinion on both has changed over the years as I learned about which option works best in different situations and wanted to pass this knowledge along. So why should anyone care about a good base layer? Simply, a base layer is supposed to manage thermoregulation and moisture. When either is out of whack, you will be too. For example, what is more important in rainy or wet conditions – to avoid moisture or to avoid getting cold? 99.9% of the time, the answer is pretty simple – to avoid getting cold. After all, you can be plenty fine while wet, but you’ll be plenty dead when cold. A functional base layer works to manage your body’s temperature, first and foremost, but also to avoid prolonged wetness which can evolve into all kinds of nasty skin/health conditions in addition to cooling you off. Other than thermoregulation, the other key word when describing the importance of a base layer is “wicking” which is nothing more than the movement of moisture away from your body. The argument in support of merino wool is a popular forum topic which has emerged in recent years because of the legitimate science behind it and the popularity of some mainstream backpacking notables who support its use. The emergence of merino wool versus straight wool has dramatically changed the texture and comfort of wool products which were generally known to be extremely warm, but also extremely uncomfortable and itchy. Most will claim wool is vastly superior when it comes to odor control which is the chief reason it gains so much support. It also offers decent warmth to weight ratio, breathes better than most synthetics, and actually repels moisture a little better due to its fiber structure as merino wool is naturally wicking while synthetic materials generally are not. In fact, most synthetic materials receive a treatment to ensure they adequately transport moisture. In untreated areas or when the treatment wears off, the material begins to retain moisture. Probably of no surprise is the reality that the thinner (more fine) of a material, the greater the likelihood is for it to transport moisture more efficiently. This is true for nearly any fabric. As part of the transport and thermoregulation process, wool essentially absorbs moisture while synthetics allow moisture to run over it instead of through it. Wool also takes a little longer for the user to feel wet because it absorbs the moisture inside the fiber instead of merely running it across the fiber. Unfortunately, merino wool is usually very expensive and rips easily. Some report being allergic to merino products which is generally noted by redness or skin irritation causing the user to itch. Capilene, however, dries roughly 50% quicker and it has a better warmth to weight ratio, although it feels cooler when wet because it is lighter and more air permeable. It is less costly and won’t rip as easily. Some report it feels clammy when wet. Some Capilene and similar synthetic products use silver treatments on the material or within the materials fibers to make it odor resistant. When it comes to a true measurement of “stink”, it should be noted that body odor in fabric is essentially bacteria. Wool is anti-bacterial by nature whereas synthetic materials are not and therefore wool wins this aspect. As of now, I haven't heard of anyone claiming alergies from Capilene products, although there could be. In summary, Capiline is lighter, less costly, more durable, dries quicker, and offers decent warmth and stink control. Merino wool is generally more comfortable, offers superior odor control, and wicks better (naturally). It is also a natural material, but one which some may cause some to have an allergic reaction. So which is better? The answer is that it depends on your preference, function, environment, and wallet...much like most gear. I use both on and off. I think in most conditions, especially prolonged activity over several days, I favor merino wool for its inherent odor control and comfort. When exposed to extreme cold or endless rain, synthetic is generally my choice. Capilene is a mainstay in my sleeping gear as I know sleeping isn't an activity where it is going to get wet or stinky and I’d rather carry the lightest option. Regardless of which I choose, I like light colors in summer and when it's buggy, and dark colors at all other times. The light color is cooler in the summer and doesn't attract as many bugs, and the dark color absorbes more light and thereby helps dry the fabric more quickly (and may retain a little extra heat too). So – that’s my two cents. As I sit here typing this blog, I’m looking at 24” of snow which was dumped in central Virginia in addition to the rest of the eastern states. My back is aching from shoveling and my car will go absolutely no where until a snow plow visits my small and rural residential community. Unlike even a single other person on my street, I got the bright idea to set up my tent the night before the storm so I could gain some additional experience camping in snow and cold conditions. My wife and the closest neighbor within view apparently exchanged several phone calls throughout the evening which generally went something like this: (Neighbor) “Is your idiot husband still outside?” (Wife) “Yes, my idiot husband is still outside?” (Neighbor and Wife while slapping forehead) “What an idiot!”. After getting rid of my GoLite Shangri-La 2 floorless tent following an evening in another storm in which I accidentally kicked out my supportive trekking pole resulting in the whole structure falling down on me, I’ve been using an older tent I have while contemplating my options for its replacement. The older tent is an 8 pound North Face which I will not be carrying anywhere for any great distance. It’s a good tent, but entirely too heavy and the Shangri-La was supposed to be my solution. Unfortunately, at 6’6”, the Shangri-La simply wasn’t long enough which is a running theme in my life regarding gear. I’m not a huge snow camper for lots of reasons. First, Virginia isn’t known for season long accumulations of snow and therefore I don’t get a lot of experience as I don't frequently make it out of Virginia. The ski resorts Virginia has actually makes most of its own snow. Second, snow camping is still something I find pretty difficult - meaning I don’t like being unable to travel as much as I’d like and I have personal issues with so little sun during the day as I feel like the day is over just as I get started. Nonetheless, I study the heck out of gear just as personal interest. In this case, it will help me decide what 4-season tent is the best option for me. I wanted to pass along my personal choice for an excellent 4-season tent in the event that some of you may be in the same boat and need a lightweight and functional option. First and foremost, I’ll go ahead and directly mention the extremely popular manufacturer Tarp Tent and Henry Shire’s various solutions for 4-season shelters. I love Henry’s stuff, but, for example, his extremely popular "Moment" just isn’t strong enough to really handle legitimate snow load. It will handle the generic snow storm many of us would likely experience and it is priced very competatively, so perhaps I'm being overly critical. Oware, Black Diamond, and others have pyramid floorless options which are pretty popular too, but again the surface area lengthwise usually isn't enough and I also don’t like the rigging required on the center pole to achieve its full height. So what is my choice? The Stephenson’s Warmlite tent (www.warmlite.com/tents.htm). WARNING….as I mentioned on an earlier blog, the Stephenson’s are/were nudists, so plan on seeing some colorful pictures in addition to their lengthy and difficult to follow narratives. Regardless of their unusual approach to business, if you have the money, I just haven’t found a better engineered and lightweight solution which offers such a great space to weight ratio. Quite honestly, they are a solid option for year round backpacking too. These tents are elliptical shaped which helps a great deal in wind and offers unsurpassed strength and space. It also comes with lots of options in addition to overall size, colors, wind stabilizers, windows, larger entry points, vestibules, vents, etc. So how light is it? 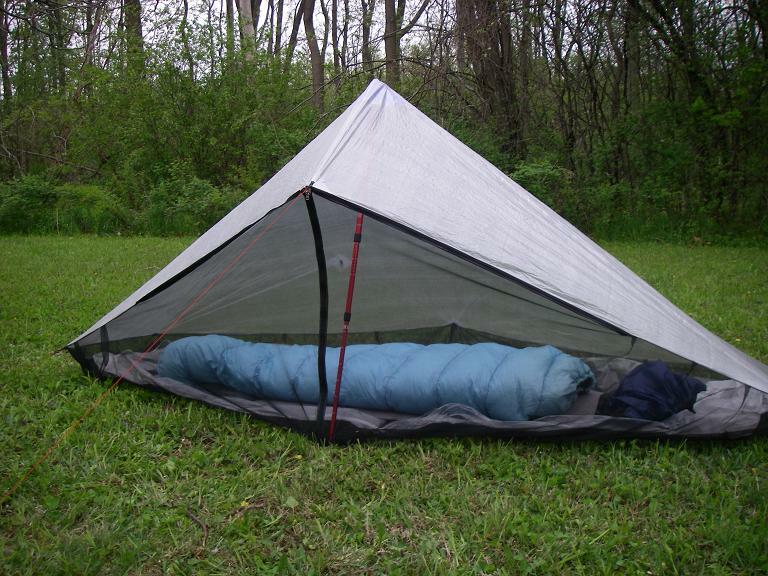 Well, for the model I like, the two-person 2R, it comes in at an astoundingly low 2.75 pounds…and that’s for a double-wall genuine 4-season tent. When compared to Tarp Tent's Moment, the 2R is taller by an inch, wider by 20"-40", longer by 5", comes with a larger vestibule, is capable of handling greater snow loads, is arguably better ventilated, and fits two people instead of one. But....it is also nearly $300 more expensive than the Moment and comes in at around a pound heavier. Stephenson also offers a similar single-wall two-person tent which comes in at a mere 2.33 ounces! One of the reasons I like the double wall is because Stephenson lines it with a reflective barrier which helps keep wind out while preserving interior warmth (it also acts as a well need vapor barrier). It blocks out some light, but that’s one of the reasons why the user can pick their own color as it affords them the ability to lighten the interior color (and exterior) as they see fit. Personally, I’m a big fan of light green on the outside and yellow on the inside as it hides better in the woods and offers decent interior light. Stephenson's offers tents for 2, 3, and 5 people, all at very reasonable weights. If you've got the money to spend, want the extra room, and need something that will truly stand up to the elements, consider the Stephenson's Warmlite tent. Over the course of 2009 I had the opportunity to read several great backpacking books and also watch a handful of backpacking DVD’s. Having only minimal time to backpack, I find these resources help fuel my interest and allow me to live vicariously through the accomplishments of others. 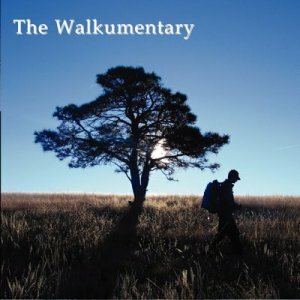 One DVD I recently watched was “The Walkumentary” (http://www.backpackinglight.com/cgi-bin/backpackinglight/walkumentary_dvd.html) in which Lawston “Disco” Grinter takes video of his 2,800 mile thru-hike of the Continental Divide Trail (CDT). Near the end of the video, Disco and four friends crown one another with makeshift crowns to recognize their accomplishment of successfully hiking the Triple Crown (Appalachian Trail, Pacific Crest Trail, and CDT). I think that mile-for-mile, the AT is the toughest on the body and the PCT is the easiest on the body. The CDT, especially in Montana, is really brutal. Lots of up and down, just like the AT, and the lack of maintained trail and in some cases non-existent trail make it the toughest state to hike in on the entire Triple Crown in my humble opinion. The CDT is a good bit easier in Wyoming, Colorado and New Mexico though. The AT is consistently tough from Georgia to Maine. The AT is easiest to get water. The southern California section of the PCT in dry years can result in hikers carrying large amounts of water. In 2004, I carried 7 liters out of one spot. In 2008, which was a much wetter year, the most I carried in southern Cali was 3.5 liters. It really depends on the year with the PCT. New Mexico is known to have some long water carries but in the Fall of 2006 when we hiked thru, the most water we carried was 2.5 liters. Mainly because it's a good bit chillier in the desert in the fall. If we had hiked New Mexico in the Spring, it would have been a bit tougher. Weather . . . the AT has the most rain . . . hands down. The western states are just plain drier. On the PCT in 2008, we didn't get any rain at all until central Washington. Not a drop. We walked from Mexico to central Washington completely free of rain. That'd be the equivalent of walking from Springer to say Gorham without any rain. Having said that, I've been in some brief but violent weather on the CDT . . . thunder, lightning, hail with 50+ mph winds. In 2004 on the PCT it rained 3 out of every 4 days for the last month on the trail. But the AT consistently gets more rain than the CDT/PCT. Resupply . . . the CDT has the toughest resupply. Especially in Montana/Idaho where you will hike 5 days, hitch 20 miles down to the nearest town and have a convenience store to resupply from for the next 5 days. Lots of mail drops take care of this tough resupply situation on the CDT. I've logged about 12,000 miles since 1999. I've been able to find the time and the money to do this amount of hiking because I made it basically my #1 priority. Out of that 12,000, I've done four 2,000+ mile hikes. Each time I was in a transition period of sorts. When I hiked the AT, I was just out of college. My first PCT hike, I quit a job. My CDT hike, I had just moved to Colorado and wasn't tied to a job. My second PCT hike, I left a seasonal job. Moneywise . . . I saved money like it was my job. I made saving money for the next big hike a priority. I also got smarter on the trail. I spent $4,500 during my first PCT hike and $2,100 during my second. Staying away from towns and hotels resulted in the bulk of my savings on my second PCT hike. A couple years ago I purchased a dehydrator because I was convinced I was going to be backpacking on a near daily basis. After all, dehydrating is what “real backpackers” did and that was my goal. Well, marriage, kids, and eternal responsibility have a way of clarifying reality. In as much as I’d like to use the dehydrator for the backpacking trips I am able to schedule in the midst of balancing life, I use it a lot less than I expected both because it is a bit of a hassle and often I just don’t have the time to deal with it. When I’m pinched for time or need something quick, my options for trail food either include food from the local grocery store or lightweight options available from online sources. With that, I thought I’d mention a few food sites offering lightweight options which I enjoy. Both Enertia Trail Foods (http://www.trailfoods.com/#) and Pack-It Gourmet (http://www.packitgourmet.com/) are likely the best known dehydrated vendors aside from those at REI. To me anyway, these meals taste better and offer solid nutrition. Harmony House Foods (http://www.harmonyhousefoods.com/) offers quite a bit of stuff which includes sizeable portions of only add-in (i.e. beans, spices, tomatoes, cheese, butter powder, etc.). Much like Just Veggies (http://www.justtomatoes.com/), they offer items which are nice contributions to any meal and can be used to add taste, nutrition, or just to mix it up. Aside from, well, “permanently borrowing” (i.e. stealing) from fast food vendors, have you ever wondered where you can get single use packets of things like salt, pepper, relish, mustard, etc.? The answer is Minimus Biz (http://www.minimus.biz/). If you’re looking for a healthier version of jerky, check out Paleokits (http://paleokits.bigcartel.com/) who sell jerky, nuts, and berries with less sugar and carbs. As mentioned in an earlier blog, Meal Pack (http://mealpack.com/) offers meal replacement options in the form of a bar the size of a standard Cliff Bar. It is packed with calories and might be a good idea if you need to boost your energy with a mega dump of calories (energy). It might also be a decent emergency food option in case you are late making it off the trail. Few products offer the punch of necessary fat and calories in a lightweight package like peanut butter. If you want to carry something with differing tastes in a single serving container, check out Justin’s Nut Butter ( http://www.justinsnutbutter.com/). All of these vendors are identified on the side of my blog in addition to many other links which might help you on your backpacking journey. Throughout each backpacking year, I often switch between a tarp and fully enclosed shelter. I make this change depending on where I’m backpacking, the weather conditions, the temperature, and even who I’m hiking with as sometimes privacy is nice. For quite awhile I had been eyeballing Henry Shires Tarp Tent Contrail (http://www.tarptent.com/contrail.html). It was extremely light at 24.5 ounces and quite honestly I thought it was a pretty fair price at $199 considering other tents on the market. Set up requires four stakes, one trekking pole, and with that it is possible to achieve 45” on headroom entrance, 84” of length, and 42/30 inches of width (it tapers towards the feet). The Contrail represents Shire’s best selling tent which he attributes to the fact that it is extremely lightweight and a fully enclosed shelter for one person. I had held off buying it for about a year because I simply didn’t think it would be big enough for me at 6’6”. To be quite honest, I was waiting for Six Moon Designs to come out with their redesigned version of the two-person 16 ounce cuben fiber Refuge-X or even SMD’s new solo tent for taller hikers known as the “Vamp”. But, design and production were delayed and the previously scheduled release date of fall 2009 was tentatively pushed to spring/summer 2010. I had also been trying to figure out if Gossamer Gear’s The One would fit a person my size and the results weren’t promising enough to buy it. The only other shelter I was looking at was Gossamer Gear’s Squall Classic which was essentially a Tarp Tent/Gossamer Gear joint venture which resulted in a Tarp Tent made of spinnaker fabric that brought the weight down considerably. Unfortunately, it also brought the price up fairly substantially and I didn’t want to buy something that was so expensive which wasn’t guaranteed to work. In the end, it was worth it to me to give the Contrail a shot. Worth mentioning is Shire’s continued excellent customer service and impressive quality. I’ve always appreciated his product because of his dedication and being quite humble about it. Simply, he is exactly what the lightweight backpacking cottage industry needs. Within just a couple days of ordering, the Contrail arrived and I remain pleased that Shire’s keeps a stock of his products to prevent customers from waiting for their gear to be made. I immediately set the Contrail up in my basement to quickly assess whether it would fit someone my size. I used a couple of dumbbells to act as tie-outs which are uniquely designed to be completely and easily adjustable which makes it extremely easy to get a taut pitch. If it didn’t immediately fit me size, I was going to return it and Shire’s was plenty fine with that. After setting it up I was pleasantly surprised by the well engineered lines of the structure and the general appearance of quality. Without being overly descriptive, it is exactly what the name implies – a “tarp tent”. It is literally a tarp with a small amount of mosquito netting on the sides, front, and back for ventilation which is attached to a silnylon floor. It has a couple of pockets on the inside, a small vestibule on the outside, and a little flap by the footbox which can be opened or closed to achieve more ventilation or to seal it up in foul weather. Flatly, it is pretty ingenious. To my surprise, I fit lengthwise and there was actually plenty of elbow room near the entrance. I could sit up at the front, albeit hunched over a bit, with minimal contact to the pitch of the ceiling. Being that this is a truly minimalist shelter, for what it represents, I honestly think would be a perfect shelter for an average-sized camper and a tolerable shelter for bigger folks. If there was a little more height at the front and foot end, I actually might think it was perfect. Pitching it on a level surface meant that all conditions were highly controlled. On a hill, I would likely find the length a bit tight if I slid during my sleep, but this could be mitigated by both finding good tent sites and adding some sealant to the floor to make it a little less slippery. Having done both, I haven’t had a problem yet with the length. With that, I decided to add the Contrail to my backpacking shelter arsenal. I seam sealed it in the manner suggested by Shires, although it does look like Helen Keller and Stevie Wonder may have tag-teamed the effort. Over time I realized that the single trekking pole necessary to maintain the height at the front entrance could be pulled off to the side. My second trekking pole could be pulled off to the other side which would then create an unobstructed entrance with equal or greater stability and it would also ensure I didn’t accidentally role over my other trekking pole and break it or otherwise allow it to be available to critters who might choose to nibble on the salt in the handstraps. Aside from the height, which may be fine for smaller people, I only have two complaints. I found that my quilt touched the ceiling at the footbox when I used a fully inflated sleeping pad like the NeoAir. By touching the ceiling, it meant that my quilt would get wet. Because the sleeping area is fairly small, my top entrance bivy wasn’t something I could realistically use as there was no way I could wiggle down into it, so my solution was to put my rain skirt over my feet and that worked fine. When I used my CCF pad and pack under my feet, which is what I use 99.9% of the time anyway, this was not an issue. If you look at Shires' newest offerings, he is now using a curved stay at the footbox of most of his latest tents and I read somewhere that this feature will be on all his new tents as it greatly opens space for minimal weight. Adding a feature like this to the Contrail would be a nice option, although I'm pretty sure a tent similar to the Contrail with this feature would be sold as another tent with other minor differences. During one hellacious rain and wind storm while on the Appalachian Trail recently, the front vestibule did blow open. The front vestibule is designed to be off the ground several inches to aid in ventilation. With this gap, it is susceptible to strong winds. I sealed it again, which is nothing more than a strip of Velcro, and had no further problems. I should mention I remained completely dry in the rain and tough winds. 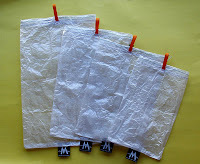 The silnylon fabric is susceptible to mist and such, but it does not drip down. On Shire’s website he lists the tent as having variable width and somewhat variable height at the footbox. Essentially, the variable width isn’t realistic as he is counting area which includes mosquito netting on the sides. Obviously anyone who wants to keep their tent in good shape isn’t going to lay on the mosquito netting for any length of time. Similarly, the floor is a genuine bathtub floor which means it does great in wet conditions and can’t really be folded down to expand the width being that it is sewn at the corners. Basically, it’s wishful thinking to say the width is adjustable because it really isn’t. The footbox height, on the other hand, is adjustable. The footbox sits on struts which can be raised or lowered depending on the users preference. After tinkering with it several times, I found a spot somewhere in the middle and just left it alone from there on out believing that additional adjustments just weren’t worth it after a long day hiking. In the end, the Contrail is a wonder and lightweight 3-season full coverage tent. My only legitimate desire is that it were a little bigger overall, but then again at my size this tends to be my wish for just about everything. I highly recommend it to anyone looking for a quality piece of gear at a reasonable price. After a 30 mile backpacking trip on the Appalachian Trail with some friends last week, this weekend my wife and I camped at Big Meadows in Shenandoah National Park. Unlike out west or New England, Virginia doesn’t normally pick up snow until late December or January/February. As such, it was a complete surprise to both of us when the forecast mentioned there was definitely going to be precipitation which meant snow as Virginia was experiencing an unusual cold snap. The result was non-stop snow all weekend which resulted in about 6” and effectively shut down the roads on Skyline Drive. The snow and ice also scared away most people who had reservations during mid-October, the peak leaf-peeping season, which meant those who decided to brave the conditions had a wonderful time to see the park during a really great time with limited population. Worth mentioning is how well the Park Service did to treat and clear the roads later in the weekend as well as the great service provided by Aramark whose employees are familiar with finding a way to work even in difficult conditions. The video shows a deer within a few feet of our tent which woke me up on Sunday morning. Outside of camera range were six others which surrounded our camp. This experience is part of the magic of Big Meadows as deer sightings within camp, and usually within a few feet of someone with a camera, are very typical. It’s a great place to go for anyone who wants to get closer to nature and a quick way to ensure children find immediate enjoyment. Other than deer, I’ve seen black beer, turkey, bobcat, coyotes, foxes, possum, rabbits, frogs, hawks, owls, and other wildlife just about every time I visit. If you want a quick escape and one which is guaranteed to bring an immediate smile to your face, try Big Meadows. You’ll not only enjoy the wildlife, but you’ll learn about the history of the Park, the history of the Indians and mountain folk who were essentially kicked out when the land was dedicated as a National Park, the efforts of the Civilian Conservation Park who literally broke their backs to build the Park, and the unique nature of the meadow itself which boasts and endless supply of amazing plants and flowers which have a history of their own. One piece of gear that gave me some mental grief was rain gear. I simply couldn’t figure out what I wanted to carry which was lightweight and kept me dry. For a long time I wore Gore-Tex Paclite, which worked fine until I started sweating because it didn't breathe very well. Getting soaked from the inside is just about as bad as being soaked from the outside (although it was warmer...which is actually more important than anything else). Ultimately I didn't like carrying it because I rarely used it and continually thought it wasn’t worth the weight. I then switched to eVENT, which was wonderful, but again I didn’t like carrying the extra weight because it was an item I rarely used. DWR treated garments worked to some extent and were lighter, but often felt clammy or cool and eventually the DWR wore off. Finally I wised up and settled for a DriDuck/Frogg Togg outfit which worked fine as I had no intent on using it for bushwacking and it was both lightweight and highly breathable…not to mention inexpensive. My choices in rain gear then pushed me in a direction I never thought I’d go – to wearing a skirt. I figured the lightest pair of rain pants was good enough, but the reality was that all rain pants are generally a pain to put on because it required that I take off my shoes. With the exception of those made with extremely breathable fabrics, most were usually hot, didn’t ventilate very well, and cost more than I’d like. In the end, I settled on the Rain Wrap from ULA-Equipment (http://www.ula-equipment.com/). Now I fully appreciate the fact that a man wearing a skirt comes with it a certain lack of machismo, but the reality is that I choose my backpacking gear by electing for function over fashion. The function of a rain skirt works well, but little did I know the skirt would be one of those multi-use pieces of gear which I simply can’t imagine not carrying at this point. The ULA-Equipment Rain Wrap has many imitators, but I like this version for several reasons. Aside from keeping my legs dry and offering good ventilation, the Rain Wrap can also be unfolded flat to be used as a ground cloth, sleeping system cover for drippy shelters, a modesty wrap when doing laundry and not having a spare piece of clothing, and even a sling. I could envision it as a temporary water container too and other things, but you get my point. It even has a key chain and a small pocket for it to pack into itself into a very small package. A medium is 2.9oz and $25, a large is 3.2oz and $25, and an XL is 3.7oz and $28… less expensive and more functional than any rain pant that I’ve found. I don’t hike nearly as much as I’d like principally because there are bills to be paid and mouths to feed. With that said, I often find myself not being in the physical condition I’d like to enable me to hike with ease. Usually somewhere around mile 10, my calves and quads start to burn and the bottom of my feet get fatigued. From that point on my level of enjoyment starts to decrease dramatically. As much as I’d like to say the remedy for this is merely to hike more, the reality is that I simply don’t have the time right now. Therefore to build leg strength and endurance, my only choice is to exercise the necessary muscle groups when I have the time. Leg lifts, leg presses, dips, lunges, and calf raises are all part of my weight routine, but they haven’t given me as much result as I had hoped. Running, cycling, and elliptical cardio efforts have helped with endurance, but not much with leg strength. To supplement my leg exercises, I decided to buy a weight vest. The first thing I noticed when looking around was how expensive the vests were and then how much more they were when shipping was included. Since weight generally determines the cost of shipping, this drove the prices up dramatically and made purchasing most vests unrealistic. 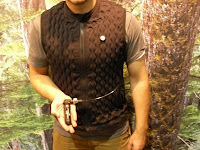 One vest I liked in particular was from J Fit. It was a 30 pound neoprene vest which seemed about right for the amount of weight I want my body to get used to carrying. It had padded shoulder straps, adjustable chest straps, and a pocket for a music device. It also came with a highly visible reflective tape which allowed the user to be more visible when wearing it outside. Although I didn’t like the increased “dork” factor, the reality is that reflective tape is a good idea being that if a car was bearing down on me, the weight of the vest itself would definitely slow my lackluster cat-like reflexes and thereby the shimmering of the vest itself may be the only thing saving me from becoming a permanent hood ornament. Ultimately I found the J Fit vest for $57 and only $15 shipping. The seller used the new U.S. Postal Service boxes to his benefit as the slogan of “if it fits, it ships” meant that he could stuff 30+ pounds in a small box and ship it for a fraction of the cost other vendors were pushing. Granted, when I received the box it was completely demolished, but I got it safe and sound otherwise. I’ve worn it several times for everything from short-term hiking to 3+ mile runs and it works great for its intended purpose. Over time I hope it will help me become a better backpacker. Grant Sible with Gossamer Gear was nice enough to provide me with some details about a new tent they are working on. It is currently under the personal development of Glen VanPeski and it sounds like the tent is still undergoing quite a few tweaks and "may" be available in 2010. It is diamond-shaped and sets up with two trekking poles and two stakes (think about that...). Because of the shape, it should be plenty long enough for taller backpackers. Again though, this is in the "maybe" stage. I'm anxious to see how it compares to the new "Vamp" tent from Six Moon Designs which is also supposed to be for taller backpackers and is slotted for release in 2010. Backpackinglight is putting the final touches on a new backpack. The pack is nearly ready for production with only minor cosmetic changes forthcoming. It is roughly 28 ounces and 40L-45L in capacity. It will come with shoulder straps and hip belts which are modular to fit different body types. It comes with a removable frame, roll top closure, two big outside pockets, and hipbelt pockets. The attached grainy picture is all that I have for now. As mentioned in one of my earlier blogs, BPL is also tinkering with a lightweight tent initially referenced as the "Tartan". A little known favorite company of mine is PHD Mountain Software (http://www.phdesigns.co.uk/). They make all kinds of extremely high end sleeping bags and clothing options. Their gear is literally second to none and many say it is actually better than other options within the US which are generally considered top notch too. Well, PHD is going to be releasing lightweight quilts in the near future. Because they frequently use 900-down fill, they can offer extremely warm products which are still very lightweight. It will be interesting to see what the future holds for this great company and I would imagine they will give Nunatak and Western Mountaineering a bit of competition. Hopefully 2010 will prove to be a fruitful year for lightweight gear. Looking for an alternative to keep animals and critters out of your food supply that isn’t as expensive as a bear canister but is more durable than a simple mesh or plastic bag hung from a tree? Well, try GrubPack (http://www.grubpack.com/). Grubpack is an animal resistant bag made of stainless steel mesh. It is flexible and durable, although an animal could still crush your food if they wanted to. It comes with a polyester Velcro closure which seals better when wet. It is also UV resistant and comes with a brass grommet for hanging. Use it with something like an OPSAK bag to make it waterproof. So, how much? 18” x 15” (1,178 cu/in) is $29.99, 18” x 20” (1,864 cu/in) is $32.99, and 18” x 26” (2,275 cu/in) is $35.99. 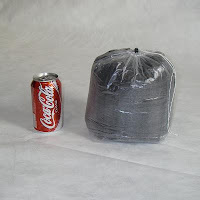 If you're wondering, Rat Sack also makes a similar product (www.armoredoutdoorgear.com). For whatever the reason, I’ve focused a disproportionate amount of time on what socks to carry while backpacking. Whether it was to cut ounces, find something more durable or warmer, or to identify a sock that dealt better with moisture and stink, the reality is that socks and foot care are a terribly important topic while on the trail. First I made the switch from SmartWool to DarnTough for my daily hiking sock. Then I switched from merely another dry pair for sleeping to PossumDown such as those sold by http://www.chocolatefishmerino.co.uk/ or http://www.shopnewzealand.co.nz/ . I find the PossumDown to be a quite impressive sock overall and the material works well for lightweight beanies and gloves too. It wicks well, retains excellent warmth, doesn’t hold stink like cotton, and it is extremely lightweight considering my intent is merely to use it for sleeping. Last winter when trying out a hammock and not having the ideal gear for the job, I felt like I wanted something a little more substantial for my feet because my quilt wasn’t sewn with a footbox and I was losing a lot of heat through the bottom of the hammock. I also acknowledged some moisture was coming through the hammock which I wanted to avoid. My solution was the Integral Designs Hot Sock (http://www.integraldesigns.com/product_detail.cfm?id=681) which at between 4.2-4.9oz (small to x-large) was on par with most standard socks like those sold by REI, SmartWool, DarnTough, etc. The difference was that these hotsocks were insulated with Primaloft offering ½” of loft. The outside of the sock was made of Pertex microfiber which allowed it to repel moisture while ensuring it was highly breathable. The bottom of the sock was reinforced with abrasion resistant 500 denier Cordura which is helpful for late night bathroom runs when putting on a shoes is a hassle. 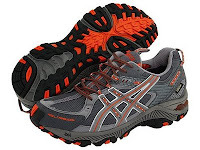 Basically, they are a very warm, functional, and sensible option for cooler temperatures and run around $45. Over the Labor Day weekend I was finally able to get out for a brief backpacking trip after rehabbing two bad knees since April and following foot surgery just two weeks ago. It is amazing how quickly the body FORGETS simple things like walking with a pack. This is my polite way of saying that making decent mileage wasn't my friend and I found it to be actually quite difficult to find my trail legs. I'm hoping they'll return soon as it is quite discouraging to be unable to do something I enjoy to the extent I feel I should be able to. I'm fortunate because I live less than 30 minutes from the Appalachian Trail trailhead in Shenandoah National Park and the AT really never gets old to me as there is always something to see. I often get lots of questions from people who have never seen the AT. Although the attached videos are nothing to write home about, I wanted to show a couple things. First, wildlife is in abundance whether it is the deer (pictured) or an endless number of hawks, owls, butterflies, and all kinds of insects. Basically, the forest is definitely alive and there is never a quiet moment. The first video is of two bucks which were literally standing on the trail about 20 yards in front of me as I rounded a corner. They slowly migrated off to the underbrush as I fumbled to find my camera which meant they were mostly out of sight for a decent photo or video. About 30 yards from them I saw a black bear flipping over rocks looking for grubs, but the video isn't worthwhile to post due to the vegetation. The second video is merely a flat part of the trail that I decided to post principally because I constantly hear debates between tent/tarp supporters and hammock supporters about which system is better, especially for the part of the AT that goes through heavily wooded states like Virginia. The trail I walked today, with exception to the two huts I passed, was completely unsuitable for anything other than a hammock. Although the wildflowers throughout the park made the scenery nice, I started to think long and hard if I was ever going to find a place to stop that didn't require that I hang between two trees. One aspect of my backpacking experience that I’d like to change is the food I carry both in quantity, weight, quality, and effectiveness. Much like many backpackers, I have a tendency to dehydrate what I can and carry lightweight food options. Unfortunately, these meals are often too bulky, a pain to cook, or otherwise lose their appeal. Other than not eating, dehydrating, taking less food, or bringing less cooking components, there are two simple ways a lightweight backpacker can lower their pack weight when it comes to meals. The first is to skip bringing meals that require cooking. After all, ounces and even pounds can be saved by leaving a stove and fuel behind. Personally, I like a hot meal at least once a day, so I'm not ready to leave my stove at home all too often. When I do, it is often in favor of a fire to cook food anyway. The second method to lighten packweight is to skip a formal lunch and instead eat calorie dense (high energy) snacks throughout the day which is more common as snacks such as nuts can provide more punch than a more formal meal. One vendor that specializes in replacing meals at minimum weight is Meal Pack (http://www.mealpack.com/). Meal Pack offers a variety of bar-like food items which weigh in at +/- 3 oz. Unlike other snack bars, these bars serve as a nutrition replacement for an entire meal and in the neighborhood of 450+ calories per bar. That’s roughly 150 calories per ounce…which isn’t too bad considering it is more or less an entire meal packed with vitamins and amino acids for about $1.29 per bar. Just think - a packable “meal” around 3 oz for 450 calories at a mere $1.29. Not too shabby. It also cuts down on bulk and the nuisance of trying to grab little things like M&Ms or peanuts. I eat mine over a period of time and not all at once as I really don't want all that energy all at once. I think the only down side is variety in taste as often it is nice to eat many different things for the same snacking period to keep your tastebuds happy. 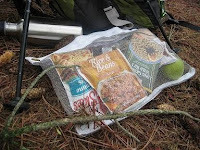 I first heard of Meal Pack while reading the gear list for Triple-Crown lightweight backpacking adventurer and author Francis Tapon (http://www.francistapon.com/). Well, if it is good enough for him, I figure it is probably good enough for others out there who have a need for dense calories in a tasty lightweight package. ONE OUNCE...2200 cu/in Backpack - Believe It! Have you ever had an urge for a ONE OUNCE backpack? Well, a backpacker named Mark Henley was kind enough to post information on how to construct one out of Cuben fiber fabric on Gossamer Gear's website http://www.gossamergear.com/gossamergear/images/myog/Henley_1oz_instructions.pdf. If you are a "make your own gear (MYOG)" type of person, this might be an excellent opportunity for you to try your hand at really pushing the limits of lightweight backpacking. Course, if you aren't, you could always purchase a high quality Cuben fiber pack with all the frills from Z-Packs (http://www.zpacks.com/). If you're wondering where to get the materials, there are many options to include Quest Outfitters (http://www.questoutfitters.com/) and Thru-Hiker Fabrics (http://thru-hiker.com/materials/index.php). Last week, Robin of Backpackbasecamp.com (http://www.backpackbasecamp.com/basecamp/blogengine.net/) was kind enough to stop by and commented on my NeoAir thread about Argon filled sleeping pads which will hit the market very soon. She even has a nice article and video about it on her website. Rather than reinvent the wheel, I figured it would be appropriate merely to redirect you to her site. Argon is a widely available and safe inert gas which creates warmth by extracting the heavy molecules out of the air and is alleged to create warmth greater than even the finest-quality down. Argon is impervious to wet conditions and even has some buoyancy. In years past, it was used in wetsuits and window insulation with great success, so it is no surprise that it had made the leap to backpacking. Personally, I think this represents a pretty interesting product for lightweight backpacking, but it does have some limitations which includes the potential to leak and the need to inflate the item after each use with a pressurized Argon-filled container similar in size and concept to a CO2. 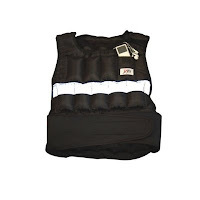 Klymit (http://klymit.com/store/) of Utah is spearheading this effort and they are presently taking preorders for pads and vests at a 25% discount. Please note, this discount is only available through July 31st. And if you were wondering, no…they don’t make XXLs so I’ll sit on the sidelines for this one. If you haven’t heard of the NeoAir (http://cascadedesigns.com/therm-a-rest/mattresses/fast-and-light/neoair/product), you very well may be living on the moon. How about this – it took 5 years to design. The Thermarest NeoAir by Cascade Designs is claimed to be the lightest most advanced air mattress on the market. If you belong to any backpacking forums, it has probably been mentioned at nauseam following their debut just a few months ago which ultimately caused stock to disappear worldwide. I read about it, studied it, and contemplated it much in the same manner as other gearheads. When I finally decided to get one, I and everyone else was saddened to learn that Thermarest wasn’t going to release more until September 2009. I put in my preorder and hoped for the best. In late June, I learned REI was scheduled to receive an early shipment and decided to cancel my September order and buy one from REI instead. When buying a NeoAir, the first choice is to decide on the size. The NeoAir comes in 4 sizes: Small (9oz/47”x20”), Medium (13oz/66”x20”), Regular (14oz/72”x20”), and Large (19oz/77”x25”). As a lightweight backpacker, my first thought was to go for the smallest – torso sized. Having the small in the store, I tried it, and found there was a tremendous pain in my lower back from where my legs had no support. Even though I typically use my backpack to put under my legs in my current method, my pack simply wouldn’t provide enough elevation to make the pain go away. I also found that the width of 20” was a little comical. At 6’6” and 280 pounds, I wear a 52XXL jacket. 20” simply wasn’t going to cut it even if the shortened length was desirable. After trial and error, I came to the realization that I needed the large. It was 77” long which was enough and 5” wider than all the others. I wasn’t thrilled about carrying 19 ounces being that my current closed cell pad is 9 ounces, but I figured a good night of sleep would make it all worthwhile. The next step in buying a NeoAir is to swallow your pride like a jelly doughnut and pony up a ridiculous amount of money for it. The large was $170 plus $13 in tax and another $14 for shipping. That brings this fun little purchase to nearly $192. Let me say that again, $192. For this money, you get a large NeoAir mattress, instructions, a little box about the size of a water bottle – and guess what – no stuff sack. I tried the NeoAir using several methods and even asked my non-backpacking wife to give it a shot. I ultimately compared it to a couple closed cell pads and a longer air mattress from Big Agnes. The NeoAir is made of Nylon, although it feels like a very thin grade. Much of the chatter about this product is in regards to its ability to provide a decent R-value which it claims to be 2.5. “R-value” is a measure of thermal resistance and becomes an important consideration when sleeping outdoors in colder weather. In a nutshell, the higher the R-value, the better off you’ll be when it comes to your body heat being transferred to the cold ground. As you can imagine, increases to higher R-values pads often increases costs, weight, and bulk. 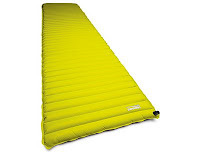 How does a 2.5 R-value rating compare to other sleeping pads on the market? Well, check out an earlier blog of mine for a simple chart I put together (http://jolly-green-giant.blogspot.com/search/label/Lightweight%20Sleeping%20Pads). In a nutshell, 2.5 is a very good rating overall especially if you can get by with a smaller size and thereby less weight. As you increase in weight, I think something like the Stevenson Warmlite DAM (“down air mattress”) would be a better purchase. But here’s the thing and the principal point that should not be overlooked – the NeoAIR is NOT an insulated mattress. Nearly everything else with a comparable R-value has down fill in it. The NeoAir provides warmth without fill and boasts to be three times warmer than any other non-insulated air mattress available. So where does the NeoAir gain its R-value? Well, it has two patent-pending internal technologies which essentially allows the material to retain body heat much in the same way as an emergency blanket due to a reflective and aluminized urethane film. Because of this technology, it can cut out other stuff used by other manufacturers which would be nothing but dead weight. To the touch, the NeoAir feels paper thin – almost fragile. It is baffled and claims to have an interior triangular core matrix which creates an internal truss system providing for greater stability and the welded nylon grid to create chambers of air 10 times more than other traditional air mattresses. This minimizes the movement of air within the pad and thereby provides convective cooling. It can be easily blown up in just a couple of breaths which also means you don’t need a pump. 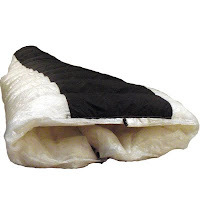 Keep in mind however, the water vapor created by blowing it up could be a problem in winter environments which is why genuine winter air mattresses use an external sack. So what were my impressions? Well, mixed. I felt it was quite fragile, but the reality of lightweight backpacking is coming to grips with very lightweight things that can do the job plenty effectively. Just because it was lightweight didn’t mean that it was a bad product. After spending quite a bit of time trying different positions and different inflation levels, I decided I didn’t like being elevated which is a common problem (to me) of air mattresses. I also didn’t feel it was wide enough when lying on my back despite it being wider than most. I did not have the same problem when laying on my side. I didn’t like the fact that I felt like there was a high spot in the center of my back which formed because the weight of my shoulders and lower limbs forced air up to a lighter part of my body. I also didn’t like the fact that I was touching the ground at times when attempting to find an inflation level that worked for me. I didn’t like the fact that I couldn’t just roll it up and instead needed to push the air out and spend time rerolling it. I felt indifferent about its tacky surface as it was nice not to slide around on a common silnylon tent floor, but it wasn’t always great to have my body stick to it. As a general principal, I don’t like the fact that it could pop. If it did, I already know I wouldn’t have a repair kit and then I’d need to improvise or cut my trip short – neither of which would put me in a good mood. Overall, inflation is critical as too much or too little greatly impacts comfort and if adjusted too much to the point to where it hits the ground – then the warmth is lost. I was able to find fairly decent comfort with about 50% inflation. With my weight on the pad, it was enough to keep me off the ground but looks pretty pathetic when not on it. Shifts in weight also create changes to inflation in certain areas and it takes a short while for the temperature to adjust to the change. One thing that still surprises me, although probably shouldn't after understanding the design, is the fact that it literally feels "warm" when laying on it. I can't explain it, but it feels like it is radiating heat. Unlike something else which more or less takes on your body temperature when you lay on it, this actually felt warmer. When I used it outside in the summer months in Virginia, I can't say it was comfortable to have something radiating heat back to me, but I could clearly imagine liking it in the cooler months. I also found the more I used it, the more I liked it depite my complaints. Basically, most of my “negatives” were as a direct result of my bias towards air mattresses as I am a big fan of closed cell pads. After all, closed cell pads are cheap, lightweight, durable, low to the ground, and have a very respectable R-value. To me, they are comfortable too. Their only negative – they don’t pack small and options when carrying them is to use them inside a pack to give it shape or to strap it outside. Thus far in my backpacking career, this has been my preference and plenty tolerable to me. My wife is a side sleeper and she felt the NeoAir was reasonably comfortable. She reported the fabric was a little noisy and said that she didn’t much care for the baffling, although admitted it probably gave a more stable surface. Despite my wife being an average build and 5’5”, she felt it wasn’t wide enough. When asked which she preferred (between the NeoAir, a closed cell, and Big Agnes), she rated the NeoAir the best for the simple reason that it was the widest even though she didn't think it was wide enough. She rated the Big Agnes last because she felt it was too narrow and comfort was worsened by the elevation of the inflation. So where does this leave you? Well, the NeoAir is a niche product in the sense that it is very lightweight and effective at what it is supposed to do. Whether you find it comfortable is a personal decision based on your physical size, sleeping habits, and general preference. If you don’t mind air mattresses as a whole, than you probably won’t have a problem with it. I don’t think it would do well around sharp objects, so if you sleep with your dog (for example), consider leaving the dog outside as I really wouldn’t feel comfortable exposing the NeoAir to dog nails. I have also heard of people who left their NeoAir inflated while they went on a hike in the middle of summer. When they returned, they found that several chambers had popped or otherwise enlarged due to expanding heat as caused by the sun. For me, the question is am I keeping it? My answer is yes and quite honestly I made the decision only after driving all the way to REI with it repackaged and intent on returning it. I literally inflated it in the REI parking lot and tried it out again in a field next to the store before deciding to keep it. I think it is fair to say that I was comfortable enough to feel I could use it down the line, but just not thrilled with the comfort or the weight. My preference remains with closed cell pads and my rationale to keep it was for use in the winter, to supplement my existing system, and/or for my wife. If it isn’t already abundantly clear, I should admit that I am a simpleton when it comes to this kind of stuff as I’ve never really found an air mattress to be anything more than an inflatable raft. Throughout my life, because of my size I became all too familiar with sleeping on the floor as beds weren’t long enough. In fact, I spent most of my first two years in college sleeping on a piece of carpet and did the same each time I stayed at my in-laws for the first 2 years of my marriage. Sleeping on floors isn’t comfortable, but to me it was better than not being able to stretch out or being bent in funny positions on beds that were too small. So, I’m biased and find comfort in simple accessories such as low to the ground and squishy closed cell pads. If you find air mattress comfortable and you are an averaged sized person, especially if you are a side sleeper, this may be a good product for you if you don’t mind spending the money.